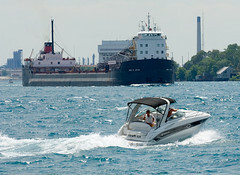 Its been a couple of weeks since we went to Port Huron shooting the river traffic and Desmond Landing area. This is one of the shots from that trip with a very unusual Great Lakes Freighter going by the name "John D. Leitch." For more images from that excursion visit my Flickr Photostream for July 8th.